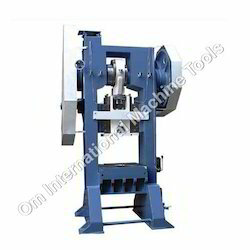 Manufacturer & Exporter of Presses Machine By OM International Machine Tools which changes the shape of a work piece by the application of pressure. Press Machine Manufacturer in India leads the way to produce and export Press Machines with lowest possible cost and highest possible quality of the machines. We are Manufacturers of all types of presses machine like hydraulic press machine, c-type power press machine, h-type power press machine, pneumatic power press machine, etc. 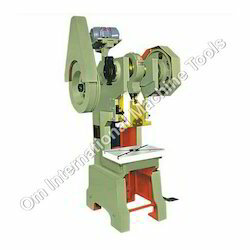 We are one of the well-known manufacturers and suppliers of C Type Power Press Machine. The offered c type power press machine is a machine tool, which is capable of changing the work piece shape by pressure application. Our supplied c type power press machine is provided with gear drives for uniform load distribution, throughout the surface of the material. We are one of the widely acclaimed manufacturers and suppliers of H Type Power Press Machine. The offered h type power press machine is a mechanical wonder for forming procedures. Our supplied h type power press machine is provided with hard wearing metal bushes for facilitating smooth pressing operation. The offered h type power press machine is available at very affordable market rates. We are one of the leading manufacturers and suppliers of Hand Operated Hydraulic Press Machine. 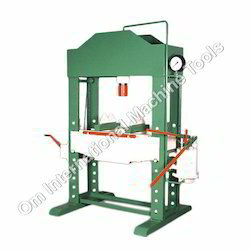 The offered hand operated hydraulic press machine is a heavy structure, which can bear heavy loads and shocks. Our supplied hand operated hydraulic press machine is widely used for pressing operations on industrial materials and sheets.